Carol Bove, La traversée difficile (The Difficult Crossing), 2008, mixed media. Installation view, Kimmerich, Düsseldorf. Photo: Ivo Farber. So why do I have a sense that the appearance and content of contemporary art have been curiously unresponsive to the total upheaval in our labor and leisure inaugurated by the digital revolution? While many artists use digital technology, how many really confront the question of what it means to think, see, and filter affect through the digital? How many thematize this, or reflect deeply on how we experience, and are altered by, the digitization of our existence? I find it strange that I can count on one hand the works of art that do seem to undertake this task: the flirtations between Frances Stark and various Italian cyberlovers in her video My Best Thing, 2011; Thomas Hirschhorn’s video of a finger idly scrolling through gruesome images of blown-apart bodies on a touch screen, occasionally pausing to enlarge, zoom in, move on (Touching Reality, 2012); the frenetic, garbled scripts of Ryan Trecartin’s videos (such as K-Corea INC.K [Section A], 2009). Each suggests the endlessly disposable, rapidly mutable ephemera of the virtual age and its impact on our consumption of relationships, images, and communication; each articulates something of the troubling oscillation between intimacy and distance that characterizes our new technological regime, and proposes an incommensurability between our doggedly physiological lives and the screens to which we are glued. But these exceptions just point up the rule. There is, of course, an entire sphere of “new media” art, but this is a specialized field of its own: It rarely overlaps with the mainstream art world (commercial galleries, the Turner Prize, national pavilions at Venice). While this split is itself undoubtedly symptomatic, the mainstream art world and its response to the digital are the focus of this essay. And when you look at contemporary art since 1989, the year Tim Berners-Lee invented the World Wide Web, it is striking that so little of it seems to address the way in which the forms and languages of new media have altered our relationship to perception, history, language, and social relations. In fact, the most prevalent trends in contemporary art since the ’90s seem united in their apparent eschewal of the digital and the virtual. Performance art, social practice, assemblage-based sculpture, painting on canvas, the “archival impulse,” analog film, and the fascination with modernist design and architecture: At first glance, none of these formats appear to have anything to do with digital media, and when they are discussed, it is typically in relation to previous artistic practices across the twentieth century.² But when we examine these dominant forms of contemporary art more closely, their operational logic and systems of spectatorship prove intimately connected to the technological revolution we are undergoing. I am not claiming that these artistic strategies are conscious reactions to (or implicit denunciations of) an information society; rather, I am suggesting that the digital is, on a deep level, the shaping conditioneven the structuring paradoxthat determines artistic decisions to work with certain formats and media. Its subterranean presence is comparable to the rise of television as the backdrop to art of the 1960s. One word that might be used to describe this dynamica preoccupation that is present but denied, perpetually active but apparently buriedis disavowal: I know, but all the same . . . THE FASCINATION WITH ANALOG MEDIA is an obvious starting point for an examination of contemporary art’s repressed relationship to the digital. Manon de Boer, Matthew Buckingham, Tacita Dean, Rodney Graham, Rosalind Nashashibi, and Fiona Tan are just a few names from a long roll call of artists attracted to the materiality of predigital film and photography. Today, no exhibition is complete without some form of bulky, obsolete technologythe gently clunking carousel of a slide projector or the whirring of an 8-mm or 16-mm film reel. The sudden attraction of “old media” for contemporary artists in the late 1990s coincided with the rise of “new media,” particularly the introduction of the DVD in 1997. Overnight, VHS became obsolete, rendering its own aesthetic and projection equipment open to nostalgic reuse, but the older technology of celluloid was and remains the favorite. Today, film’s soft warmth feels intimate compared with the cold, hard digital image, with its excess of visual information (each still contains far more detail than the human eye could ever need).³ Meanwhile, numerous apps and software programs effortlessly impersonate the analog without the chore of developing and processing; movies imbued with the elegiac mood of Super 8 can now be taken on your cell phone. So why continue to work with “real” analog equipment? Artists like Dean, the preeminent spokesperson for old media, stake their attachment to celluloid as a fidelity to history, to craft, to the physicality of the editing process; the passing of real film is a loss to be mourned. The sumptuous texture of indexical media is unquestionably seductive, but its desirability also arises from the impression that it is scarce, rare, precious. A digital film can be copied quickly and cheaply, ad infinitum; not so a 16-mm film.⁴ Rosalind E. Krauss has invoked Walter Benjamin to elucidate the use of analog media in the work of William Kentridge and James Coleman, drawing on Benjamin’s belief that the utopian potential of a medium may be unleashed at the very moment of its obsolescence. But today this assertion needs to be subject to scrutiny. The recourse to Benjamin’s argument, so closely tied to the historical avant-gardes, sounds almost nostalgic when applied to these younger artists, especially when analog film seems fashionable, rather than cutting against the grain. (It also seems striking that this discussion didn’t happen decades ago, when video began to supplant celluloid.) The continued prevalence of analog film reels and projected slides in the mainstream art world seems to say less about revolutionary aesthetics than it does about commercial viability. Manon de Boer, Attica, 2008, 16 mm, black-and-white, 9 minutes 55 seconds. Installation view, Lunds Konsthall, Lund, Sweden, 2009. Another contemporary mode steeped in the analog is social practice. It is worth recalling that Nicolas Bourriaud’s earliest texts on relational aesthetics set artists’ desire for face-to-face relations against the disembodiment of the Internet; the physical and the social were pitched against the virtual and the representational. In the past decade, socially engaged art has tended to favor intersubjective exchange and homespun activities (cooking, gardening, conversation), with the aim of reinforcing a social bond fragmented by spectacle. Yet social relations today are not mediated by monodirectional media imagery (the mainstay of Guy Debord’s theory) but through the interactive screen, and the solutions offered by “useful art” and real-world collaborations dovetail seamlessly with the protocols of Web 2.0, introduced in 2002: Both deploy a language of platforms, collaborations, activated spectatorship, and “prosumers” who coproduce content (rather than passively consuming information devised for them).⁵ As we have seen so many times in the past decade, most recently at the Seventh Berlin Biennalewhere the curator, artist Artur Żmijewski, invited Occupy activists into the KW Institute for Contemporary Art for the duration of the showthe results of such coproductions are difficult to contain within the traditional format of the exhibition. In 2001, Lev Manovich presciently observed that in foregrounding two-way communication as a fundamental cultural activity (as opposed to the one-way flow of a film or book), the Internet asks us to reconsider the very paradigm of an aesthetic object: Can communication between users become the subject of an aesthetic?⁶ The centrality of this question to social practice is obvious: Does work premised on a dialogic, prosumer model, seeking real-world impact, need to assume representation or an object form in order to be recognized as art? Manovich’s question also haunts more traditional sculptural practices. The recent prevalence of assemblage and “unmonumentality” in object making has been productively described by Hal Foster as “precarious” sculpture (in the work of Isa Genzken and others), even though the tendency is manifested more frequently as retro-craftiness, as seen in the fiddly collages and tapestries of the recent Whitney Biennial. Both iterations suggest some of the pressures that current regimes of technology and communication have placed on the object, which becomes increasingly fragile and provisional, as if to assert subjectivity (and tactility) against the sealed, impregnable surface of the screen. 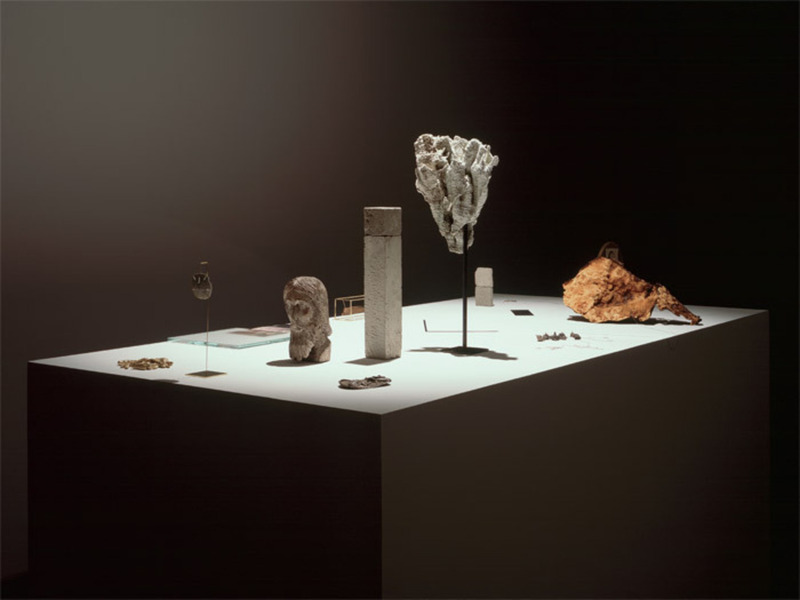 Moreover, if Genzken’s work exemplifies an older model of bricolage, in which found elements are treated as raw materials whose histories are incidental, then the more prevalent strategy since the 1990s has been to maintain the cultural integrity of the reused artifactto invoke and sustain its history, connotations, and moods. Books, performances, films, and modernist design objects are incorporated into new works of art and repurposed: Think of Carol Bove’s or Rashid Johnson’s shelves of carefully arranged knickknacks, or Paulina Ołowska’s copies of paintings by Polish artist Zofia Stryjeńska (1891–1976). This trend is manifest in other disciplines, too: Poetry, theater, and dance have all enacted their own forms of repurposing in sync with visual art, from Elevator Repair Service’s eight-hour play Gatz (which uses F. Scott Fitzgerald’s The Great Gatsby), to Rob Fitterman’s poems (repurposing anonymous tweets and Yelp reviews), to Richard Move’s reperformances of the modernist choreographer Martha Graham. These forms of repurposing differ from appropriation art of the 1980s, when artists seized imagery from art history (Sherrie Levine) or advertising (Richard Prince) with a view to questioning authorship and originality while drawing attention, yet again, to the plight of the image in the age of mechanical reproduction. In the digital era, a different set of concerns prevails. The act of repurposing aligns with procedures of reformatting and transcodingthe perpetual modulation of preexisting files. Faced with the infinite resources of the Internet, selection has emerged as a key operation: We build new files from existing components, rather than creating from scratch. Artists whose work revolves around choosing objects for display (Bove, Johnson) or who reuse previous art (Ołowska with Stryjeńska, Simon Starling with Henry Moore, Ryan Gander with Mondrian) are foregrounding the importance of selection strategies, even when the outcome is decisively analog. Questions of originality and authorship are no longer the point; instead, the emphasis is on a meaningful recontextualization of existing artifacts. Any consideration of this drive to gather, reconfigure, juxtapose, and display leads quickly to Foster’s influential theory of the archival impulse. For Foster, the term denotes art that undertakes “an idiosyncratic probing into particular figures, objects, and events in modern art, philosophy, and history.”⁷ Artists’ archives are fragmentary and material, writes Foster, and call out for “human interpretation” rather than “machinic reprocessing”; here, he clearly draws a line between subjective and technological.⁸ Artists both have recourse to archives and produce them, displaying a paranoid will to connect what cannot be connected.⁹ Foster’s examples are Dean, Sam Durant, and Hirschhorn, but we might equally consider Kader Attia, Zoe Leonard, or Akram Zaatari. Often refuting established taxonomies as a systematic organizing principle for their work, these artists embrace subjective rationales or arbitrary systems. Presented as carefully displayed collections, their installations belie the extent to which everyone with a personal computer today has become a de facto archivist, storing and filing thousands of documents, images, and music files. (I often feel as if I don’t listen to music so much as perform upkeep on my iTunes collectiondownloading new acquisitions, categorizing them, and deaccessioning unwanted tracks.) Comparing these vernacular forms of aggregation with artists’ physical arrangements of ephemera and objects, we are once again returned to the rarefied aura of the indexical and to questions of supply and demand. Susan Hiller, Dedicated to the Unknown Artists (detail), 1972–76, 305 postcards, charts, maps, one book, one dossier, mounted on fourteen panels, each 26 x 41 1/4". Artists select and aggregate not only in the production of individual works but also in the exhibitions they curate. In the 1990s, this practice was reflexively attuned to the institutional context (Fred Wilson, Mark Dion), but in the past decade it has taken a more automatist form, subordinating legible or didactic connections between works to the imperative of individual sensibility, as for example in Mark Wallinger’s “The Russian Linesman” (2009), Vik Muniz’s “Rebus” (2009), or Grayson Perry’s phenomenally popular “The Tomb of the Unknown Craftsman” (2011). Tacita Dean’s “An Aside” is an exemplary instance. As she details in the catalogue for this 2005 show at London’s Camden Arts Centre, works by Lothar Baumgarten, Paul Nash, and Gerhard Richter (among others) were selected on the basis of chance, anecdote, and coincidence. From a twentieth-century perspective, this is the logic of the dérive. From a twenty-first-century perspective, it is the act of surfing: the pursuit of impromptu, subjective connections via the aleatory free assocation of navigating the Web. In the 1960s, this kind of drift was understood as an exodus from the logic imposed by postwar city planning; today, the dérive is the logic of our dominant social field, the Internet. ONE SIGNIFICANT SIDE EFFECT of the information age is that research is easier than ever before. As the digital archive increases exponentiallyat one point, Google was archiving books at a rate of three thousand a daythe phenomenon of research-driven art proliferates in tandem. Unlike previous generations of artist-researchers (such as Dan Graham, Hans Haacke, and Martha Rosler), who tended to examine the social, political, and economic conditions of their present moments, contemporary research-based art (e.g., that of Andrea Geyer, Asier Mendizabal, Henrik Olesen) exhibits a conspicuous preoccupation with the past, revisiting marginal histories or overlooked thinkers. Some artists even make a point of using laborious, non-Google methodologies: Consider Emily Jacir’s Material for a Film, 2004–2007, an investigation into the life of poet Wael Zuaiter, the first of many Palestinian artists and intellectuals to be assassinated by Israeli agents in the 1970s. The work attempts to reconstruct as much information as possible about Zuaiter’s life, bringing together objects owned by or important to him (books, postcards, films, records), and Jacir’s efforts to locate these objects are narrated diaristically in wall texts. The presentation of research-based art and archival installations is typically at pains to confer aura and value on carefully selected physical objects; moreover, these objects remain fixed and static rather than being adaptable by users. Such works reaffirm the paradoxical compromise wrought by contemporary art when confronted with new media: The endless variability and modulation of the digital image is belied by the imposition of a “limited” edition and an aesthetics of the precious one-off (sepia-tinted prints, display cabinets, file boxes of ephemera, etc). Acknowledged or not, the research possibilities afforded by the Internet have made themselves felt in other aspects of contemporary art, too. 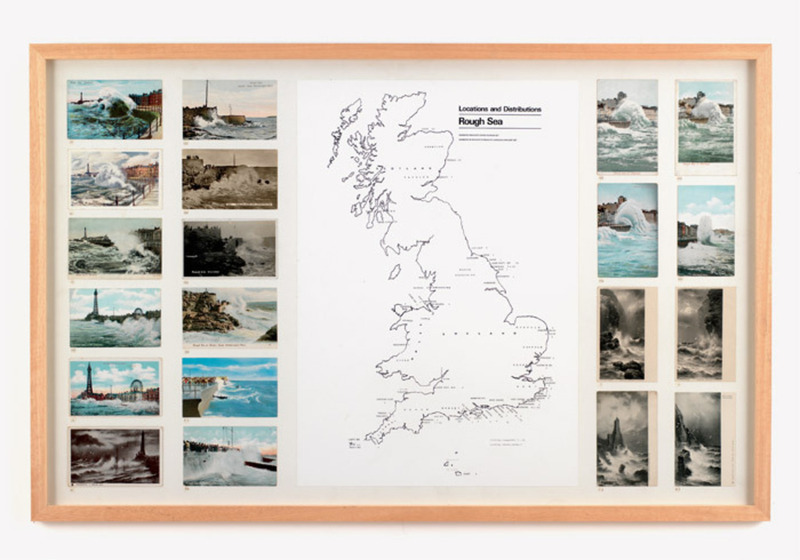 In the early 1970s, Susan Hiller amassed a series of 305 postcards that she found in British seaside towns, Dedicated to the Unknown Artists, 1972–76. Each postcard is captioned ROUGH SEA and depicts the same motifa rather bleak, turbulent ocean encroaching on human structures. Three decades later, Zoe Leonard exhibited more than four thousand postcards of Niagara Falls, clustered by type, tracing this natural wonder’s evolution into a tourist destination between 1900 and 1950 (You see I am here after all, 2008). The postcards, largely sourced via eBay, attest to the possibilities of Internet searchability. But our consumption of this work in turn reflects the changing patterns of contemporary perception: It is impossible to take in all four thousand postcards, so our eyes just scan the surface, in the rapid-fire skimming with which we browse news and reviews on our smartphones. Poet and UbuWeb founder Kenneth Goldsmith refers to the literary equivalent of this kind of work as “the new illegibility”: books like his own Day (2003), a retyping of one day’s edition of the New York Times, which invites random sampling rather than straight-through reading. When online, he writes, “we parse texta binary process of sorting languagemore than we read it to comprehend all the information passing before our eyes.”¹⁰ Today, many exhibitions (by curators rather than artists) model this new illegibility as a spectatorial condition. Documenta 11 (2002) was significant in many respects, not least of which was its inauguration of a tendency to include more work than the viewer could possibly seein this case, six hundred hours of film and video. We don’t ask how big a show is anymore, but how long: A tiny gallery can contain days of art. The result is that we filter and graze, skim and forward. 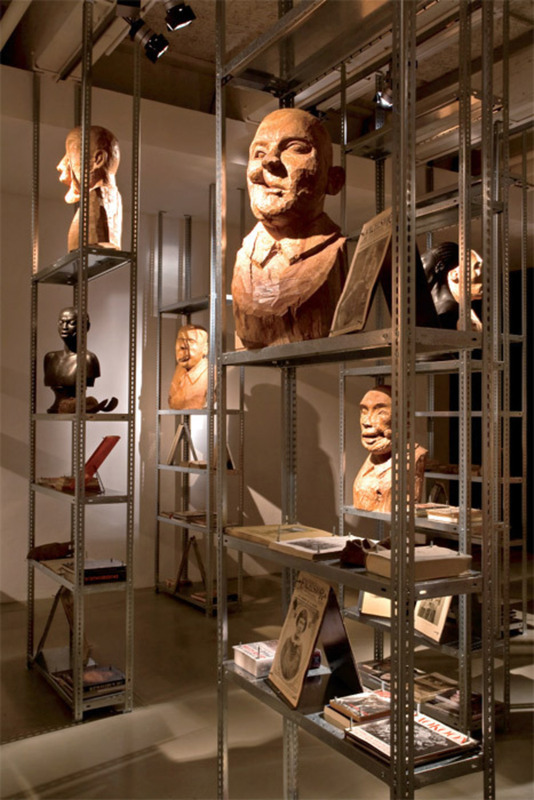 Kader Attia, The Repair from Occident to Extra-Occidental Cultures, 2012, mixed media. Installation view, Fridericianum, Kassel. From Documenta 13. Photo: Roman März. My point is that mainstream contemporary art simultaneously disavows and depends on the digital revolution, evenespeciallywhen this art declines to speak overtly about the conditions of living in and through new media. But why is contemporary art so reluctant to describe our experience of digitized life? After all, photography and film were embraced rapidly and wholeheartedly in the 1920s, as was video in the late 1960s and ’70s. These formats, however, were image-based, and their relevance and challenge to visual art were self-evident. The digital, by contrast, is code, inherently alien to human perception. It is, at base, a linguistic model. Convert any .jpg file to .txt and you will find its ingredients: a garbled recipe of numbers and letters, meaningless to the average viewer. Is there a sense of fear underlying visual art’s disavowal of new media? Faced with the infinite multiplicity of digital files, the uniqueness of the art object needs to be reasserted in the face of its infinite, uncontrollable dissemination via Instagram, Facebook, Tumblr, etc. If you borrow an artist’s DVD from a gallery, it usually arrives in a white paper slip, with VIEWING COPY ONLY marked clearly on the label; when a collector buys the same DVD in a limited edition, he or she receives a carefully crafted container, signed and numbered by the artist. Ironically, Goldsmith refers to contemporary art of the 1980s as one model for poetry when promoting his theory of “uncreative writing,” citing the history of twentieth-century art as a chronicle of thieving and stealing, from Duchamp to Warhol to Levine. In actuality, visual art’s assault on originality only ever goes so far: It is always underpinned by a respect for intellectual property and carefully assigned authorship (Warhol and Levine are hardly anonymous, and their market status is fiercely protected by their galleries).¹¹ Unlike the poetry world, where the flow of capital is meager and where works can circulate freely and virtually on the Web, visual art’s ongoing double attachment to intellectual property and physicality threatens to jeopardize its own relevance in the forthcoming decades. In a hundred years’ time, will visual art have suffered the same fate as theater in the age of cinema? Goldsmith points out that the linguistic basis of the digital era holds consequences for literature that are as potentially shattering and vitalizing as the arrival of mechanical reproduction was for visual art: “With the rise of the Web, writing has met its photography.”¹² It is telling that two of the works I cited earlier, by Trecartin and Stark, make language central to their aesthetic. It’s possible that literature, and particularly poetry of the kind championed by Goldsmith in Uncreative Writing, might now be taking up the avant-garde baton, finding ways to convey experience in ways adequate to our new technological circumstances. Yet the hybridized solutions that visual art is currently pursuinganalog in appearance, digital in structureseem always biased toward the former, so favored by the market. If the digital means anything for visual art, it is the need to take stock of this orientation and to question art’s most treasured assumptions. At its most utopian, the digital revolution opens up a new dematerialized, deauthored, and unmarketable reality of collective culture; at its worst, it signals the impending obsolescence of visual art itself. Claire Bishop is associate professor in the Ph.D. program in art history at CUNY Graduate Center, New York. 1. Even traditional forms of art, like painting, are supported by a digital apparatus: PDFs sent to the press or to collectors, JPEGS on gallery websites, etc. 2. I will leave aside painting for the moment. Its recent exponents (in the US, at least) have consciously deployed digital referents: Wade Guyton and Kelley Walker, for example, produce hybrid analog-digital paintings. Rather than downloading images from the Internet, Walker sources his imagery in library books, which are then scanned, and altered on his computer, before being transferred to canvas for one-off paintings. Again, however, these works use technology (and rather decoratively) rather than reflecting on digital visuality per se. See “The Painting Factory: A Roundtable Discussion,” in The Painting Factory, exh. cat., Los Angeles Museum of Contemporary Art (New York: Rizzoli, 2012), 11–12. 3. The analog fascination is not exclusive to contemporary art; to cite just one example, Urban Outfitters’ website now offers more than sixty products relating to cameras, most of which are based on 35-mm film or Lomography. 4. Of course, digital files are also subject to degradation through resizing and compression; the products of these processes are referred to as lossies. 5. Like performance art, social practice increasingly depends for its production and documentation on e-mail and digital photography. 6. Lev Manovich, The Language of New Media (Cambridge, MA: MIT Press, 2001), 163–64. In the words of activist and law scholar Lawrence Lessig, we no longer live in a “Read Only” but rather a “Read/Write” culture. 7. Hal Foster, “An Archival Impulse,” October 110 (Autumn 2004): 3. 10. Kenneth Goldsmith, Uncreative Writing (New York: Columbia University Press, 2011), 158. His formulation plays off and departs from current theories of scanning and saccadic vision. The precedents for this work are both literary and artistic: Gertrude Stein’s The Making of Americans (1925) and On Kawara’s One Million Years, 1969. 11. When cut-and-paste operations are transferred to literature, as Goldsmith and his many colleagues are doing, the stakes are quite different, since the economy of literature is much smaller and weaker and has no “original” to speak of. 12. Goldsmith, Uncreative Writing, 14.